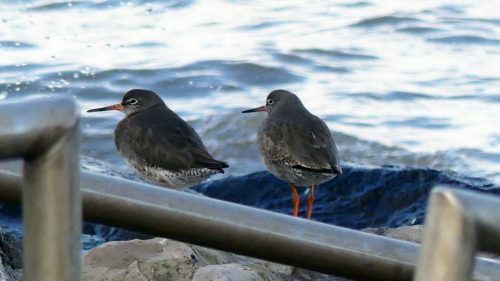 Rhos Point will soon become a quieter place as the wading birds that arrived during last late Summer and the Autumn leave us and head back to their more northerly breeding grounds. 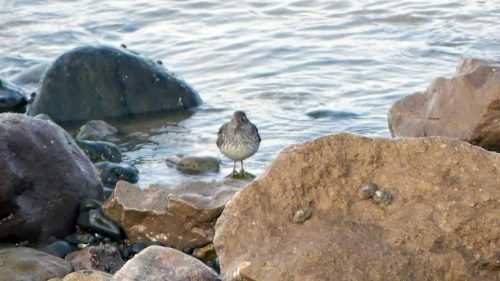 Each year Turnstones come in a fairly consistently sized flock of about 60 birds and I think it’s likely that a more unusual visitor – one that draws birdwatchers here to search for it – arrives amongst them; the Purple Sandpiper. I’d met people claiming to have seen them here earlier in the winter, but I hadn’t had even a glimpse. Until today. Taking my baby granddaughter out for some very fresh air on the Promenade, as always with one eye scanning the shoreline and one watching where I was steering the pushchair, I’d noted the tide was on the turn. Only a strip of the rocky shore below us was exposed and yet there were two people walking along it, chatting and following behind their loose and randomly wandering dog. I wasn’t thinking kindly about this as a) I don’t understand why anyone would risk their dog injuring itself on the slippery uneven surface and b) why they don’t notice or seem to care about the disturbance to any feeding birds. 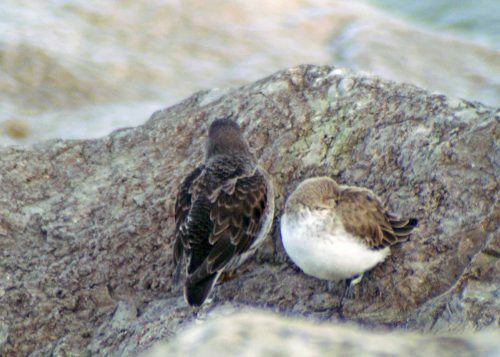 But in this instance they were quickly forgiven as the dog flushed a single elusive Purple Sandpiper from where it had probably been resting on the lower rocks of the rip-rap sea break. 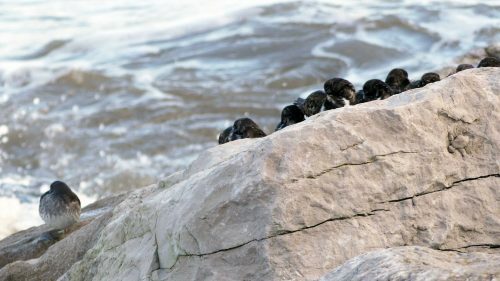 I enjoyed the lovely close sighting of these gorgeous little birds, but really wanted to see Purple Sandpipers. And there he was, on the edge of the group and still apparently alone. A lonely little Purple Sandpiper. I stayed and watched for a while in case any others popped up, but no. He was the only one. I walked a little further on, still searching, but found only two Redshanks. Again, lovely close up view of great birds, but not the colour I was looking for. 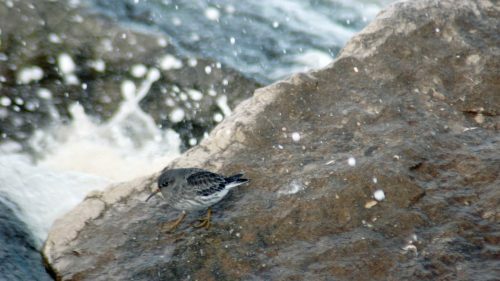 The Purple Sandpiper is a winter visitor to almost any rocky coast in Britain and Ireland. 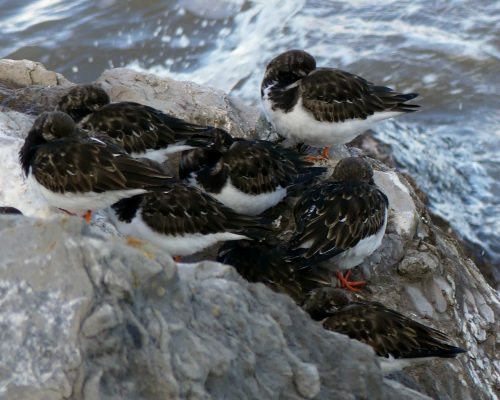 They are widely distributed around the coast though they are most abundant in the northern isles – Orkney and Shetland and along the east coast of Scotland, north-eastern England and Devon and Cornwall and scarce elsewhere. 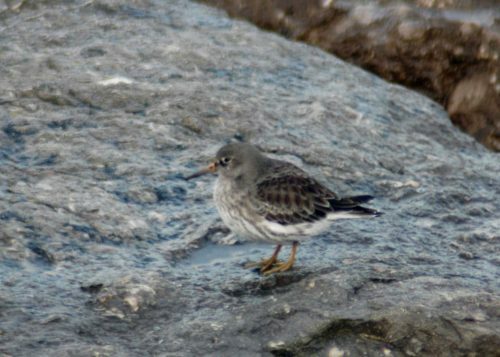 The Purple Sandpiper is a medium-sized wading bird, slightly larger, stockier and darker than a Dunlin. It is mainly dark grey above and whitish below. It has a slight down-curved beak and distinctive short bright orange legs. In flight it shows a thin white wing-stripe on otherwise dark wings. World Distribution: BREEDS Arctic & Subarctic Eurasia & North America, WINTERS: south to S Europe and Southern US. 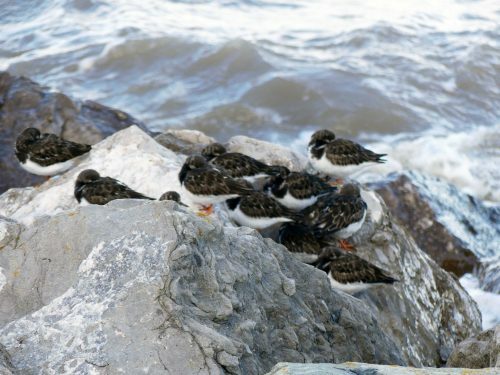 Diet: Invertebrates, also some plant material, often feeds on rocks near tide edge. Back again for another look. I didn’t even have to search for myself as a serious photographer, in full camouflage kit and sporting a super-long lens had him in his sights, saving me the effort. 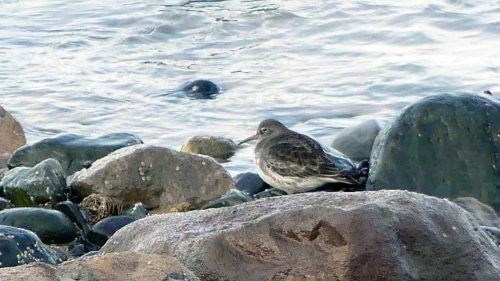 Today he was completely alone, with not even a Turnstone for company. 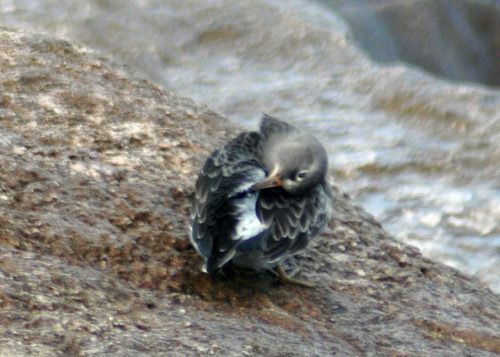 He was quite lively though, having a good preen then skipping around the rocks, splashed by sea spray and totally in his element. Still sad to see him all alone though. Closer views of the active bird today better show the purplish tint to the plumage that gives the species its name. Maybe next year he’ll bring some friends. 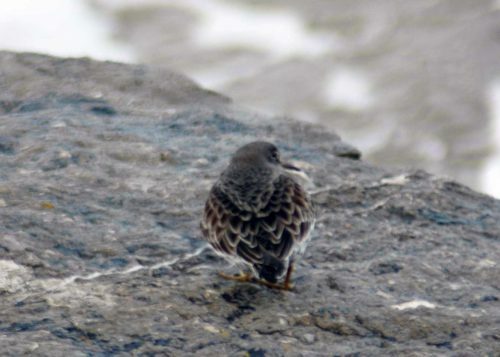 Purple Sandpiper is currently AMBER listed in the Birds of Conservation list based on a Non-breeding Population decline by more than 25% but less than 50% and a UK breeding population of less than 300 pairs.